Have you ever been caught up in a situation wherein you are unable to reply to your Gmail contacts on time? This can be quite troublesome especially if you’re dealing with potential clients or customers. Well, if you have a tool like SndLatr, then you can easily avoid such kind of trouble. 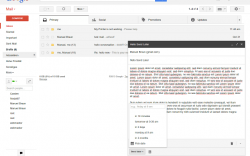 SndLatr is a free browser extension for Chrome that you can use as a Gmail add-on. 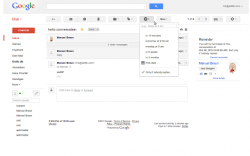 With the help of this extension, you can easily turn Gmail into an even more powerful email client. Simply put, SndLatr flaunts three main functions that give you the ability to create and send emails at a later time or date, set email reminders for conversations and create “ready-made” email messages also known as “snippets”. What’s even more interesting with this tool is that you don’t need to go through such lengths just to acquire all of these functions. Just install the extension on your web browser and you’re good to go. The way how SndLatr works is quite simple. Once installed on Chrome, the extension will automatically integrate itself to your active Gmail accounts. This means that you can use this extension regardless if you have two or more Gmail accounts. All you need to do is to log-in to the account that you want. If you’re already logged-in, just reload your Gmail tab. After which, you will be prompted to grant your permission for the said extension. Just click “OK” as soon as the pop-up window appears and after that, you will receive a confirmation message that you have successfully integrated the tool to your Gmail account. Now, keep in mind that SndLatr can do three things. First, it can help you compose and send emails at a later date or time. Second, it can help you keep track of your important conversations by setting up email reminders. Third, it can help you avoid the troublesome task of sending repetitive emails thru “snippets”. Snippets are basically like the canned responses feature in Gmail since it allows you to create a set of “ready-made” responses that you can use whenever you want. To compose a scheduled email, simply create an email message like you usually do on Gmail but instead of clicking the blue “Send” button, you must click the “Send Later” button. After that, the extension will prompt you to set the date and time that you want your email to be sent. Once you’re done, your scheduled email will be automatically stored as “draft” and it will remain there until the time that it’s supposed to be sent to your contact/s. On the other hand, you can set up reminders for your email conversations by simply clicking the reminder button that is located on your Gmail toolbox. If you click a conversation, you’ll see the reminder button right beside the labels button. So all you need to do is to set the date and time that you want. By doing so, the selected conversation will be automatically brought back to your inbox so you don’t need to look for it in your archives section. 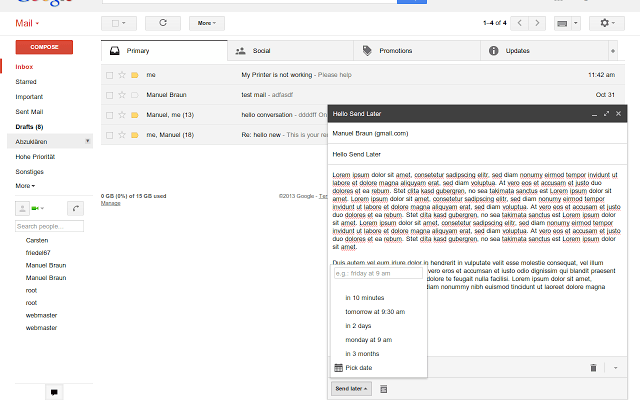 All in all, I can say that SndLatr is a pretty useful Gmail add-on. 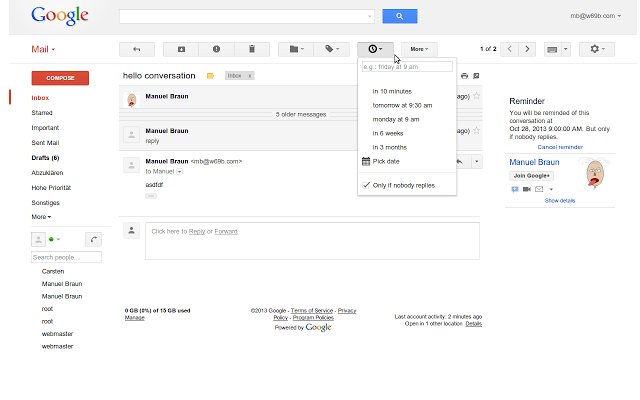 It’s also very convenient to use since it nicely integrates with your Gmail interface. It’s non-obtrusive plus it’s very stable. So far, I haven’t experienced any serious issues with this tool. It managed to send all of the scheduled emails and reminders that I’ve created on the exact date and time. It’s just that right now, it’s only available on Chrome. It would be nice if this tool could also be made available to other web browsers and platforms (ex. Firefox, Safari, Android). If you want a simple tool for scheduling your Gmail messages, you can definitely rely on SndLatr. It’s simple and user-friendly so it’s great for everyone especially to those who prefer to use Gmail over other email clients. So if you still haven’t heard of this extension yet, go ahead and check it out.